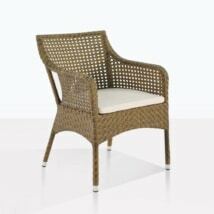 Simple, elegant and sturdy; the Petra Wicker Dining Arm Chair (Kubu) is a charming piece for your outdoor collection. 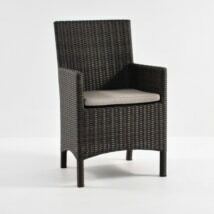 A fantastic modern design, the Petra Wicker Dining Arm Chair (Kubu) is 23 by 26 inches, featuring a chic and sharp squared off look, tall back and exposed legs. 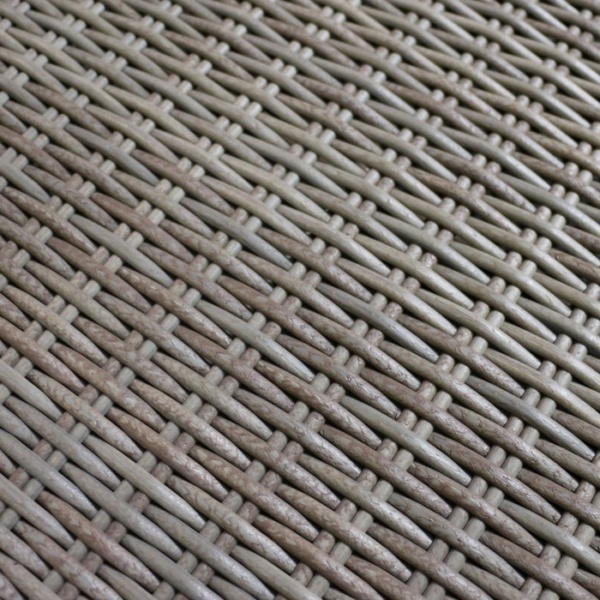 The Kubu color is a warm gray, woven into a thick wicker weave that is resplendent, luxurious and will make an brilliant addition to your space. W22" x D21" x H36"
All made from excellent Viro® Wicker, renowned worldwide for being an environmentally conscious product that is UV treated as well has being through dyed and triple strengthened – proving to be an excellent material for outdoor use. The Petra Wicker Dining Arm Chair (Kubu) is fitted with a Sunbrella® cushion, ideal for outdoors, it has built-in QuickDry® foam. At Teak Warehouse, our business is outdoor furniture! Be inspired by the incredible range of pieces on display – choose from A-Grade Teak, Reclaimed Teak, Raw Concrete, Textilene® mesh, #316 Stainless Steel, Resin and Batyline® mesh as well as 3 brands of new All Weather Wickers, giving you variety and many options for creating the outdoor living area of your dreams. Choose from stunning dining tables in rustic Reclaimed Teak, amazing loungers featuring large quantities of #316 Stainless Steel, beautiful items with Batyline® and Textilene® meshes – which are used on commercial yachts and boats. We have everything you need for the outdoors! Don’t forget our exquisite A-Grade Teak and Raw Concrete, available in many styles of tables and benches. Teak Warehouse has been in business for over 20 years. 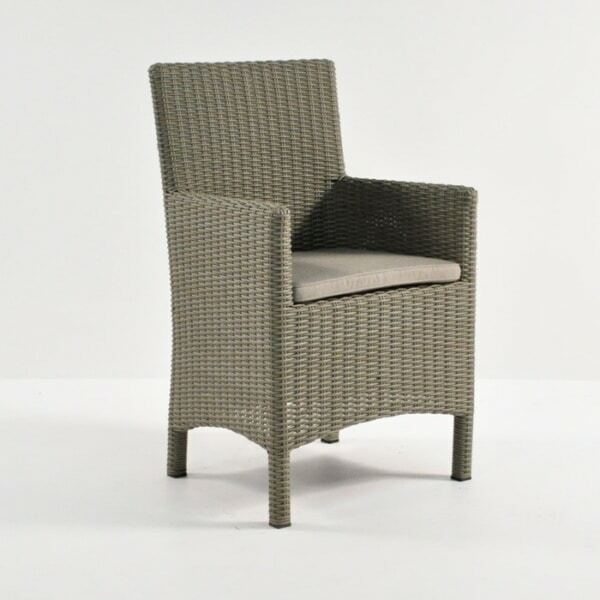 We are proud to carry items like the Petra Wicker Dining Arm Chair (Kubu) – items that are luxurious, hard wearing and at a fraction of retail costs. Our sale team is extraordinary, helping our clients find perfect items to suit the home you’ve worked so hard to create. We offer assistance at no extra charge, and are available daily from 10am. Need a quote for shipping? Call us now, we can draw up a quote swiftly with white glove delivery services all over our great country. Creating an outdoor oasis? Wanting a dining area fit for gorgeous, modern architecture to put you and your friends at ease as you celebrate food, company and the finer things in life. The Petra Wicker Dining Arm Chair (Kubu) surrounding one of our teak and stainless steel tables, such as the square style, will create a communal area, perfect for large feasts! Frame the area with some long and boxy Raw Concrete Planters filled with yummy, scented herbs or lavenders, enlivening your space and giving a sense of occasion and ceremony to your summer outdoor dinners. Perhaps your seaside home has some empty spaces? Perhaps you want a chichi brunch spot for visiting friends on the weekend? Grab one of our heavy duty Raw Concrete Tables – either a large Square or a smaller round Café style and surround with the lovely Petra Wicker Dining Arm Chairs in Kubu. You’ll be thrilled with the results. 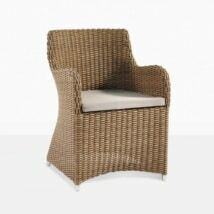 The Petra Wicker Dining Arm Chair (Kubu) is a must have from Teak Warehouse. Its stylish structure coupled with comfort and durability will be a joyful addition to your home.